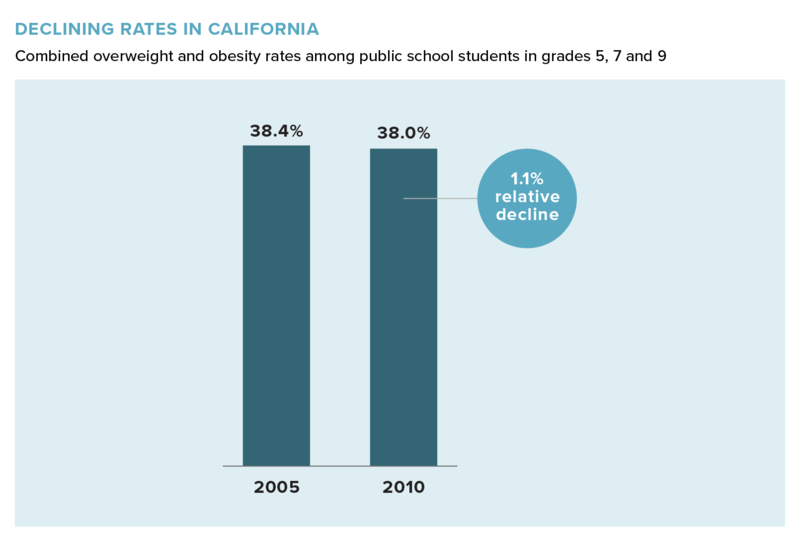 California reported a 1.1% decline in obesity among students in grades 5, 7 and 9 from 2005 to 2010. Between 2005 and 2010, the state of California saw a modest but significant decline in the prevalence of obesity among children in grades 5, 7 and 9, after 30 years of generally rising rates. The Centers for Disease Control and Prevention also reported a drop in obesity rates among California preschoolers enrolled in federal health and nutrition programs. A 2016 report shows that obesity rates among 2- to 4-year-olds from low-income families dropped 1.7%, from 18.4% in 2010 to 16.6% in 2014. In 2012, began requiring school districts to make free, fresh drinking water available in school food service areas. The Healthy Eating Active Living (HEAL) Cities Campaign, a partnership of the League of California Cities and the California Center for Public Health Advocacy, helps city officials adopt policies to improve their cities’ physical activity and retail food environments, and HEAL resolutions and policies have been adopted by one third of California’s cities. Originally posted on July 9, 2013.